Sock knitters now have something to really get their needles into with this inspirational book packed with invaluable tips and 17 fabulous projects. Bespoke socks are a joy that once experienced will make it hard for the wearer to ever return to the one-size-fits-most items of old. Full of clear, helpful instructions on how to master the knack of turning a heel, sizing a sole and creating a cuff, knitters will be intrigued and enlightened by this handy book. 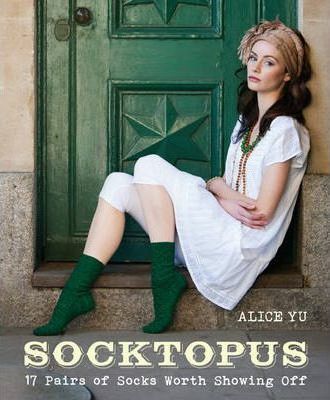 Ideal for the aspiring, advanced knitter who wants to move on to the 'Holy Grail' of perfecting the sock, Alice Yu explains the differences between types of yarn, plies and fibre and breaks down the anatomy of the sock, to help readers understand how to master each element. The projects introduce the knitter to techniques that, once mastered, will allow them to adapt and create their own designs. Any specific techniques in the projects are illustrated with clear step-by-step images and Alice's clear, concise instructions will ensure that confidence builds quickly. Alice Yu is a Canadian expat, living in London with her husband and black pug Deuce. Socktopus started out as a sock club and hand-painted yarn shop, but has now grown into the 'Socktopus Club' and the 'Knit Love Club' as well as one half of Knit Nation, London's summer knitting and spinning exhibition. Alice originally practiced as a lawyer in the City of London and has lived in London for 12 years.